This ​tough, but safe multi-surface dilutable formula uses a unique combination of pungent Limes with antimicrobial Tea tree oils. It quickly and rapidly cuts dirt, grime and soap scum from virtually any surface in your house, leaving it smelling like the warm sands of the West Indies and the Outback of Australia. Guaranteed to leave your house clean and smelling fresh it is also 99.2% natural and is made from plants, minerals and essential oils. I love this! I'll admit I was skeptical but it works really well in the kitchen and bathroom. I like how there's the option of using it as is for full strength, or diluting it with water for minor cleaning. This Nature Clean Multi-Surface Cleaner Concentrate is the only floor clearer I trust to get our floors squeaky clean! I use it both full strength and diluted, to clean everything in sight and it never disappoints! There are a lot of cleaners out there but in my opinion, Nature Clean products can't be beaten! Seems to clean well - love the smell! Nice and fresh without being overpowering. This is exactly what I was looking for - a fresh smelling, inoffensive all-purpose cleaner. Smells nice and works well. I use it diluted for general purpose cleaning. First cleaner I found that when mixed with water does not leave streaks on my shiny bathroom tiles. Though cleaning the tub I am going to use full strength next time. I love this cleaner! Works well and smells fantastic! I love this one, even though you have to add water to use, I prefer using full strength, I cleaned old dirt on the stove with it when I've moved to my new place. Smell is a little strong because I didn't add water to it, but it works well. Great product, makes everything sparkle and a little goes a long way! I love the safe ingredients in this cleaner and it smells amazing! I think it's a good value too, since it's a concentrate that you mix with water. I have only recently discovered this product and I must give a huge shout out about it. It is FANTASTIC! Smells clean & fresh, cuts through ALL dirt, grease & grime. My bathrooms are squeaky clean as are my kitchen countertops and stovetop too! Nice light scent and good cleaner on titles, walls and bathrooms. This product has a nice citrus smell and is very concentrated. I will continue to buy this product. I love this concentrate! It has such a clean natural fresh scent, but especially it leaves my floors and counters clean and shiny! 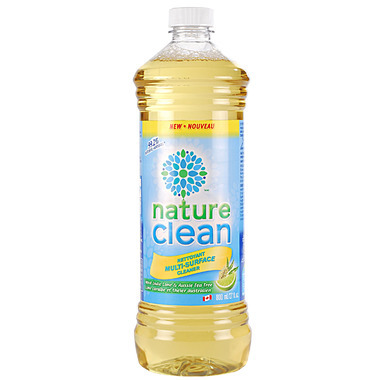 I really like all Nature Clean products. This product cleans my floors and has a pleasant smell. Not overpowering. Best part is that not tested on animals and is a Canadian company. Honestly, the best cleaning product I have ever used! I have used it diluted with water and it cuts grease and everything. Worked wonders in my kitchen! And the best part is that it is all natural and the smell is actually really good too!